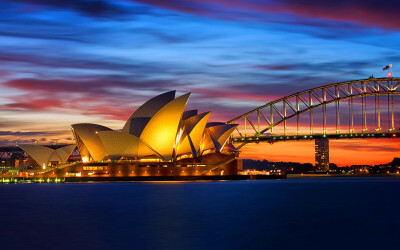 Amazing Australia Standard : AUD 2,300 per person on twin/dbl sharing basis. Welcome to Australia, the land of Koalas and Kangaroos! On arrival in Sydney, you will be transferred to your hotel. The rest of the day is at leisure. You can opt to take the Sydney Showboat Dinner Cruise with Indian dinner. Enjoy a panoramic city tour of Sydney (Seat in Coach).This morning, capture the spirit of this glorious city on a panoramic city tour.See the Darling Harbour and Cockle Bay, as you cross the Sydney Harbour Bridge. Stop at Milsons Point for spectacular views of the Opera House, Harbour Bridge and the famous city skyline. Travel through the exclusive and trendy suburbs of Neutral Bay and Mosman and enjoy magnificent views from Seaforth. Lookout over Middle Head and Pearl Bay Marinas. Stop at Arabanoo and enjoy a panoramic view of the Pacific Ocean and rugged headland. Enjoy morning tea (at your own expense) at the seaside township of Manly. Take a walk along the Corso, which separates the harbour from the ocean and see the beautiful Bondi Beach and much more.. Later, travel through Queenscliff passing Freshwater Bay and Curl Curl Beach and return to Sydney via the exclusive northern suburbs of Sydney. Conclude your morning at either King Street Wharf or Circular Quay. Bring your cameras for many stunning photographic opportunities. Set in the heart of Sydney on the beautiful Darling Harbour, Sydney Aquarium showcases over 12,000 aquatic animals from 650 species in spectacular habitat displays, including the world’s largest Great Barrier Reef exhibit and amazing underwater viewing tunnels. You can visit Sydney Tower, the city’s tallest structure, and one of Sydney’s most prominent landmarks. You may choose to walk through iconic Aussie habitats and encounter some of the most loved and feared animals that call Australia home at the Sydney Wildlife World. Enjoy full day tour of Blue Mountains with Featherdale Wildlife Park (Seat in Coach). Enjoy a full day tour of Blue Mountains with Featherdale Wildlife Park. Stretching for over one million hectares, the Blue Mountains is an inspiring mix of canyons, tall forests and heathlands, truly one of Australia’s natural wonders. Later visit the Featherdale Wildlife Park Get up close and personal with all native animals, pat and cuddle koalas, feed and pat kangaroos and emu’s; also Wwombats, tassie devils and many more. Today, you will be transferred to the airport for your flight to Cairns (Flight cost not included). Note: Flight must arrive by 1230 Hours. Transfer from airport to hotel in Cairns, en route enjoy the Kuranda experience tour (Seat in coach). On arrival in Cairns, proceed to experience the wildlife, the wilderness and the wonders of Kuranda on a full day Kuranda experience tour. Enjoy the Great Barrier Reef cruise (Seat in Coach). This morning, proceed for the ultimate Great Barrier Reef experience – The Great Barrier Reef Cruise. You’ll travel in luxury on board a modern air-conditioned catamaran to a stable activity platform on the outer edge of the Great Barrier Reef. The clear tropical waters are home to coral formations and fish life of the highest quality, colour and diversity. Experience guided coral viewing from a semi-submersible craft and glass bottom boat. Enjoy a delicious buffet luncheon featuring fresh seafood, hot dishes, salads and sumptuous tropical fruits. There are also optional activities to personalise your day on the water including certified and introductory diving and guided snorkel tours to suit all visitors from non-swimmers or first time snorkelers to the most experienced certified divers. Today, you will be transferred to the airport for your flight to Brisbane (Flight cost not included). On arrival in Brisbane, you will be transferred to your hotel in Gold Coast. Today, you will be transferred to the airport for your flight to Melbourne (Flight cost not included). On arrival in Melbourne, you will be transferred to your hotel. Enjoy a panoramic city tour of Melbourne (Seat in Coach). This Day explore the many faces and precincts of Melbourne on a panoramic city tour. Today Enjoy the Philip Island tour (Seat in Coach). See penguins, koalas and a diversity of wildlife – explore Victoria’s Phillip Island and you will be captivated by its natural beauty. The tour begins with a visit to Warrook, a working cattle farm in the prosperous Gippsland region. Enjoy the opportunity to pat and feed kangaroos, wallabies and a host of farm animals. Then, journey along the coastal highway with French Island and Churchill Island in the distance. Cross the bridge at San Remo to enter Phillip Island – natural habitat for koalas, fur seals, Short-tailed shearwater, Little penguins and more. Encounter koalas in their natural habitat at the Koala Conservation Centre. Watch the Little Penguins as they battle the surf and make their way to their dune burrows. See the Little Penguins up-close as they return to their nests to greet their young families. This Day you will Enjoy full day Great Ocean Road . Tour is one of Melbourne’s most popular tours. On the spectacular Great Ocean Road Tour experience a breathtaking coastline with pristine beaches, rainforests and charming seaside towns and of course the 12 Apostles. Leaving Melbourne we’ll stop off at a popular surf beaches on Great Ocean Road, where we will have morning tea and watch some surfers catch waves at one of the Great Ocean Road’s famous surfing destinations. We visit the historic Memorial Arch to get our photo taken before passing through the quaint coastal resort towns of Lorne and Anglesea. Count how many koalas you can spot at Kennett River and enjoy spending time with some of Australia’s native parrots, lorikeets and even the kookaburra. Day 12 Melbourne – Home town. Today proceed to airport to board flight to next destination or to hometown with lots of memories to cherish for a life time. (B) Tour Concludes! Meals as per the itinerary above. (B) – Breakfast. All Sightseeing’s & Transfers will be on Seat in Coach basis. Sightseeing’s included as mentioned in above itinerary.